Both EAP and EAL are facilitated by a team that includes a licensed mental health professional (psychologist LMFT, LSW) paired with a certified equine professional. In addition these professionals are trained and certified by EAGALA or EFMA and NARHA/PATH to ensure the highest standards of care and safety. Sessions are experiential, in which the clients learn about themselves and others by participating in creative activities with the horses in the arena, observing the responses of the horses, followed by discussion of the behavior and emotions elicited through the activity. The role of the mental health specialist is to ensure the therapeutic safety and facilitate the emotional growth of the clients. The role of the equine professional is to ensure the physical safety of the horses and clients, as well as observe and describe the horses’ behaviors in the herd and in response to the clients. 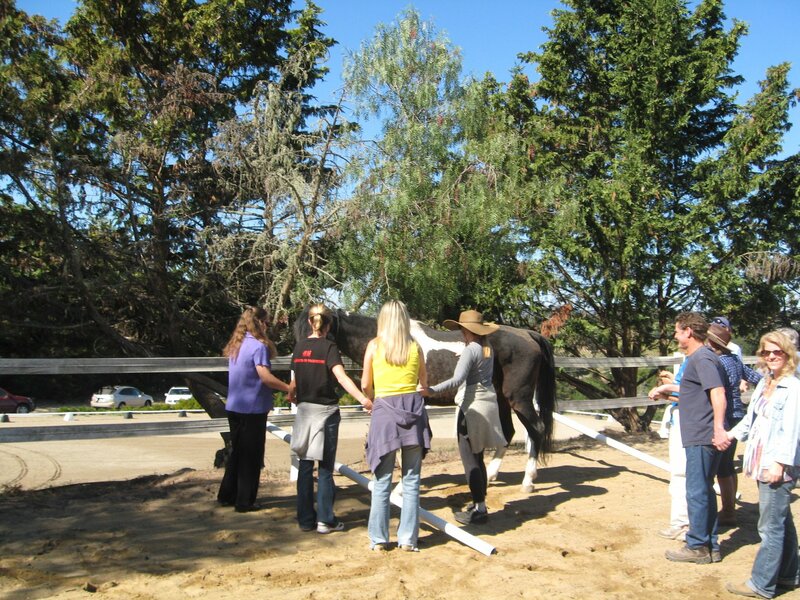 Clients are introduced to one or more horses in a safe and confidential space to provide healing and empowerment. All therapy is done on the ground, with no riding, and nor previous horse experience is needed. This form of therapy allows clients to explore authentic emotions in the context of working with the horses and others to accomplish various tasks and challenges. The discussion following the activity encourages the development of metaphors and insights into the clients’ life challenges. Breakthroughs and lowering of defenses often occur within the relationship with a non-judgmental equine partner, who serves as a mirror of the clients emotions and behavior, as well as providing metaphors to carry back to everyday life. A variety of theoretical psychological approaches may be utilized in this approach. The psychotherapeutic approach utilized is determined by the mental health practitioner’s training and philosophy, and the theories of human change and development utilized. In this particular program the approach draws primarily on mindfulness psychotherapy, cognitive constructivist and developmental therapy with the underlying belief that each person actively constructs his or her own view of reality and ultimately health. The reciprocal interaction between the therapists (including the horses) and clients shapes this process; but it ultimately the responsibility of each individual to reach the goal of self realization. In addition elements of gestalt, depth psychology, systems theory and reality therapy are utilized.